Rocco Cipparone Jr. is pleased to join the adjunct faculty at Drexel University Law School (Thomas R. Kline School of Law), at which he will bring to bear his substantial trial experience to teach a course in trial advocacy. Through this affiliation Mr. Cipparone continues his history of having taught at a law school for about 24 years to date. Rocco Cipparone Jr. is honored to have been invited to serve on this Committee by Paul J. Fishman, United States Attorney for the District of New Jersey. The Committee, headed by Mr. Fishman, also is made up of Division Chiefs in his office as well as a small invited group of prominent federal defense attorneys. The Committee evaluates and discusses important issues in the federal criminal justice system that equally affect prosecutors and defendants. It is laudable that U.S. Attorney Fishman has formed the Committee and invited select defense attorneys to serve, recognizing the value of collaborative discussion among prosecutors and defense attorneys to improve the interaction for the benefit of both sides and to address issues that are equally important to both sides. As he has for more than two decades, Rocco Cipparone continues to train soon-to-be prosecutors and criminal defense lawyers through his adjunct faculty teaching at Rutgers Law School Camden NJ. Mr. Cipparone has been reappointed to the faculty again this year. OCTOBER 22, 2013 - LANDMARK FEDERAL APPEAL WIN ACHIEVED BY ROCCO CIPPARONE JR.
Rocco C. Cipparone, Jr. again has been recognized in the December 2011 issue of South Jersey Magazine as a top attorney in the field of criminal defense. This is the fifth time Mr. Cipparone has been recognized by South Jersey Magazine in that same context. April 29, 2011: Rocco Cipparone Jr. was the invited Keynote Speaker at the Cumberland County Bar Association’s Celebration of Law Day 2011. For an article regarding the event, CLICK HERE. This year’s national Law Day theme was “The Legacy of John Adams: From Boston to Guantanamo.” Mr. Cipparone addressed a large group of prosecutors, defense lawyers, civil practice lawyers, judges, citizens and others regarding the importance and difficulties of representing persons charged with unpopular crimes, recognizing the representation of John Adams (the first lawyer U.S. President) of the British Soldiers accused in the Boston Massacre. February 4, 2011: Rocco Cipparone Jr. provides expert analysis regarding whether you can sue for damage to your vehicle caused by those pesky potholes. To view the Fox 29 segment, click here. 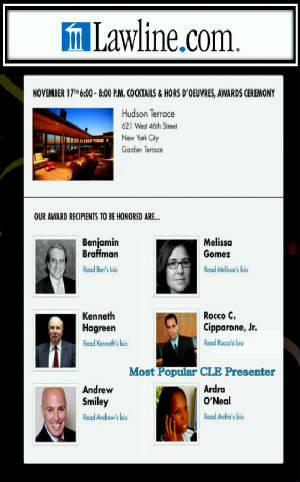 November 17, 2010: Lawline.com, a Premier Provider of Continuing Education Courses For Lawyers, awarded Rocco Cipparone as its Most Popular Presenter of Continuing Legal Education Courses to other attorneys. To see some of the reviews by other lawyers who have taken his courses, click here. Rocco C. Cipparone, Jr. again has been recognized in the November issue of South Jersey Magazine as an "Awesome Attorney" in the field of criminal defense. Mr. Cipparone has been recognized several times before by SJ Magazine in that same context. In September 2010 PBS aired a special segment (watch it here) on “Need to Know”, a 60 minute news magazine, with retrospective in-depth analysis of the “Fort Dix Terrorism” case and pre-emptive investigation and prosecution. The segment featured substantial interview with attorney Cipparone, the defense attorney who represented the lead defendant in the case, among others. Fox 29 News sought expert anaylsis and commentary from Rocco C. Cipparone Jr. regarding the unsealing of a federal indictment charging Colleen Larose, a/k/a "Jihad Jane", with several crimes including conspiracy regarding providing material support to terrorists and plotting to kill a Swedish Cartoonist Lar Vilks concerning controversial cartoons penned by the artist. Mr. Cipparone appeared on several live and video-taped segments on Fox 29 news in Philadelphia to analysis the case. CLICK HERE TO VIEW ONE INTERVIEW. Lawline.com asked Rocco C. Cipparone Jr. to join its faculty to provide continuing legal education courses to attorneys nationally, who take the video courses to enhance their knowledge of substantive law and advanced trial techniques. Joining the distinguished Lawline faculty is a natural extension of Mr. Cipparone's commitment to teaching at Rutgers University Law School as well as teaching continuing education courses at live seminars, as he has done for many years. South Jersey Magazine (Nov. 2009) has named Rocco C. Cipparone, Jr. as an "AWESOME ATTORNEY" in the field of Criminal Defense, a distinction which he also received in 2004 and 2008. The magazine profiled Mr. Cipparone as well in connection with the recognition. 11-13-2009: Rocco Cipparone appeard on the Fox 29 News at 6 pm in an exclusive interview with Fox's Thomas Drayton regarding the decision by President Obama and the U.S. Department of Justice to bring Khalid Sheikh Mohammed and four other Guantanamo Bay detainees to New York for trial in federal civil court. Among other things, Mr. Cipparone discussed the likely fact that the Justice Department will assign top-notch prosecutors to the case, the likelihood of waterboarding being a legal issue of contention in the case, adn how the prosecution likely will approach the trial from a strategy perspective. 10-18-2009: Again recognized for his experience and expertise as a criminal defense attorney and former federal prosecutor, Rocco Cipparone was consulted by Fox 29 Philadelphia's reporter Julie Kim for analysis of potential criminal charges that the parents of "Balloon Boy" could face related to the alleged hoax by the Heene family in Colorado that their child was in danger being in a home made hot air balloon. Instead, the child was hidden in the home. The hoax consumed substantial law enforcement resources and even briefly shut down Denver airport. As Mr. Cipparone pointed out in his analysis, the Heine parents could face criminal prosecution for lying to law enforcement officers, including federal charges which carry the stigma of a federal felony, potential jail term and other penalties. 08-20-2009: Rocco Cipparone Jr. appeared on the Five Spot with Fox 29's Kerri-Lee Halkett to discuss issues surrounding Scotland's compassionate release of convicted Lockerbie bomber Al-Megrahi and reaction to it. Mr. Cipparone was consulted for his expertise both as a criminal defense attorney and a former federal prosecutor. Click this link to view the video. 06-03-2009: Rocco Cipparone appeared as an expert commentator on Fox 29's Good Day Philadelphia (click here to watch video) regarding the arrest yesterday of Jose Carrasquillo, a suspect in the sexual assault of an 11 year old girl, to discuss and analyze potential ramifications of the beating and apprehension of the suspect by a crowd on the streets. Among other things, Mr. Cipparone discussed that although the actions and reactions of the crowd are understandable from an emptional level given the nature of the crime allegedly committed, such vigilantism can expose the members of the crowd unnecessarily to prosecution, incarceration, or physical harm themselves in such a volatile and dangerous situation. 05-22-2009: Rocco Cipparone appeared on an in-studio morning segment of Good Day Philadelphia, Fox 29 as an expert consultant (as a criminal defense lawyer and former federal prosecutor) regarding terrorism charges filed on May 21, 2009 against several individuals in federal court in New York in conection with an alleged plot to blow up synagogues. Mr. Cipparone also appeared the prior evening in an in-office interview with Fox 29 Investigative Reporter Dave Schratwieser regarding the case. Question: What is the emerging trend in criminal investigations and how should involved persons respond? Answer: The FBI has pending about 2,500 mortgage fraud and corporate fraud investigations. Those under investigation often make serious mistakes when responding to news of an investigation, even creating criminal liability (such as for obstruction of justice regarding records) when the person or entity otherwise was guilty of nothing. Prompt consultation with experienced criminal defense counsel to determine the best – and lawful – way to respond is crucial. Question: What should someone consider in hiring a criminal defense attorney? Answer: Some factors to consider are whether the attorney has handled a substantial number of criminal trials and the complexity of the cases; whether the attorney is Board Certified by the New Jersey Supreme Court as a Criminal Trial Attorney, of which there are only about 300 such attorneys state-wide; whether the attorney has received positive peer recognition; and whether he/she has prior prosecutorial experience.